At Astoria Animal Hospital, our approach to the canine ear is a little different than most places. This document is written to help the client understand the difficulties with the canine ear, how we recommend it is treated and most importantly WHY we do it the way we do. 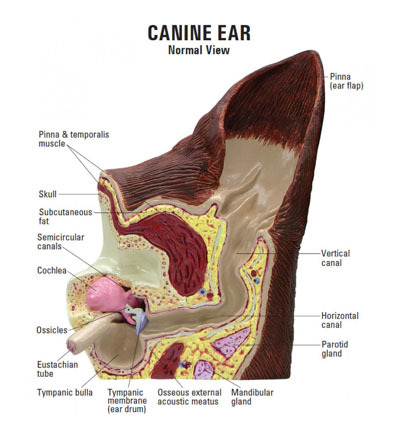 The canine ear canal is very long and has two parts: the vertical canal and the horizontal canal. The ear drum, if intact, separates external ear from the internal ear. In general, dogs with floppy ears that cover the ear canal blocks air flow and impedes evaporation from the ear canal. The anatomy of the ear canal is very important when it comes to treatment of the canine ear; be it preventive cleaning or medical therapy. The only preventative cleaning recommended is a paper towel covered finger used to blot or dry the external canal and wipe out debris. Nothing more. As a general rule, applied to all dogs, this hospital does NOT recommend any preventative cleaning at home OR any over-the-counter product to treat ears. Note: Dogs hardly ever have ear mites. Please don’t assume this is the cause of your dog’s issues and use home therapy. Doing this often sets us back and makes ear management worse. If you suspect your dog has an ear problem we at Astoria Animal Hospital like to look down the ear before any therapies or home remedies are tried. This is for two main reasons: first, over the counter medication is often more damaging to the ear. Second, if there is any liquid it fills the horizontal canal and blocks what we are trying to see. So, we can’t effectively look down the ear. Third many of the over-the-counter meds have a component that is acid to “acidify” the canal which can burn the skin which makes the ear more tender and sore. Often this pain disallows us to look down the ear at all. Most often we are able examine the ear, but sometimes the ear is too painful and we cannot. It is best to not push the issue if the ear(s) are too painful as future therapies become impossible. At this juncture, I will often make recommendations that include oral antibiotics and most likely anti-inflammatories. If we are able to visualize the ear, things we may see include: debris, hair, foreign material (grass seed, grass, sticks, brambles, rarely ear mites) and the canal itself. One thing we like to see is an intact Tympanic Membrane (ear drum). Should we see a damaged ear drum this very likely changes the prognosis for returning to a healthy ear. The most common issue we see in the dog’s ear is bacterial infection with/without a yeast component. Because the normal anatomy of the dog’s ear, especially floppy ear dogs, creates an environment where evaporation and drainage are minimal; the ear is a great environment for bacterial and yeast growth. This is especially true of very hairy ears, which is why we recommend plucking (or having the ear hair plucked by your groomer or here under general anesthetic). We DO NOT recommend that groomers use any liquid cleaner in the canine ear at all, ever. The purpose of diagnostics, in general, is to help us look inside. So, diagnostics of the ear helps us figure out what exactly is going on inside the ear. Exam, cytology, microbiology, biopsy, and imaging are among them. Exam – is discussed above and should be done every time the dog has an ear infection, even if it has been seen earlier that year. Cytology – is getting some gunk from the ear and looking at it under a microscope to see if anything is obvious. Microbiology – is getting a sample using a sterile swab and sending it to the lab for identification with culture and sensitivity. The information gleaned is both what bacteria is present (or none) and what are the best antibiotics to use against that particular infection. Remember often the ears are different and can have different infections, sometimes microbiology is needed for each ear. Note: this can get very expensive but is important none-the-less. Imaging – There are many forms of imaging and this can range from CAT scan to MRI to ultrasound to x-ray, they all show different things. We are very meticulous when treating the canine ear through this hospital and we treat them a very specific way; as if they are separate entities. At Astoria Animal Hospital it is EXTREMELY unlikely that the ears will be treated as a unit or be given on prescription for both ears. Why? By sharing medication between ears, we feel that it is more likely to wind up with more of a problem due to infection going back and forth between ears. So, we take the back and forth out of the equation and treat them separately. At the exam we will determine which ear is most affected and which one is lease affected. Medication will be prescribed and instructions will be given to treat from clean to dirty: meaning the least affected will be treated first and the most affected treated second: always. If, and only IF, we can’t determine which one is more and which one is least affected, the client will be directed to treat in a specific and uniform order, generally alphabetical: this means left first and right second. Because of the difficulty getting ears to be healthy and back to normal (please know that there are some ears that are not ever healed), it often takes weeks with several rechecks and several courses of ear medicine to make things right and clear the ear of problem. BE patient. Wash hand with hot soapy water, do not treat the ears or handle the medicine kits with dirty hands. Draw out the medication for the first ear to be treated, using a new syringe each ear each time (do not reuse or rewash these syringes). PUT THE REST AWAY TO KEEP IT CLEAN. Point the ear to the sky and massage the entire side of the head hoping that the medication will flow further into the canal. Massage for several minutes. WASH HANDS and repeat with the other ear.